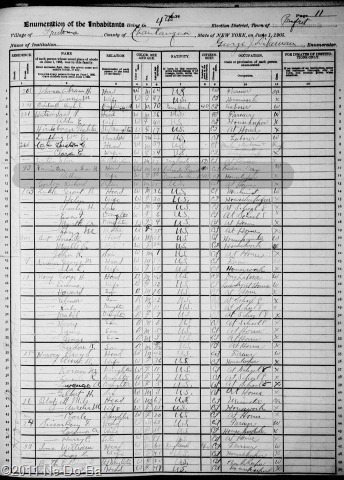 1905 New York State Census, Pomfret (Village of Fredonia), Chautauqua Co., NY, page 11, dated 1-Jun-1905. House number 93 on Howard St.
Isaac H. Kanistanaux, head, 1/4 Indian, male, 45, born “Canada French”, in the U.S. 40 years, citizen, laborer Day. This should be the child named Henry, found with Layton and Marleah prior to 1892. He has a new wife, so I should look for a marriage record for Isaac or Henry and Belle Gordon sometime between 1892 (when he was found with Christine in Addison) and 1905. It is rather curious the census taker record him as “1/4 Ind”. Seems to be very specific but not very accurate according to what I know about his parents. I have to wonder at what dynamic was involved with this unusual designation. His birth place of “Canada French” generally refers to Quebec and he says he has been in the U.S. since he was 5 or about 1865. This may assist me in deciding where to look for his parents and when.